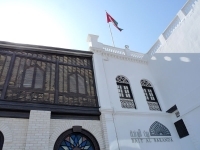 Even for those without an interest in Muscat's history, the Bait Al Baranda Museum presents a fascinating if long (750 million years) story of the region. The interactive exhibitions take visitors through tectonic plate shifts to recent folk art with an adherence to detail and historical fact. Instead of simply housing artefacts, the Bait Al Baranda's dynamic exhibits often require audience participation. The museum is situated in a remodelled historic building which also periodically features local contemporary art exhibits. Opening times: Open daily (except Fridays) 9am-1pm, and 4pm-6pm.